Lesson: Three days after meeting with the Bishop of Bayeux, Thérèse and Céline joined their father on a pilgrimage to the holy city of Rome. All the monuments, buildings and works of art were stunning, but they also taught her of the vanity of this passing world. What touched her the most was the knowledge that she was walking in the footsteps of so many saints of old, especially the Apostles and the Martyrs. Thérèse and Céline found themselves surrounded by many distinguished people whose fancy titles seemed to be nothing more than a “vapor of smoke.” She pondered these titles and earthly status and realized that those who are the poorest and the least-known on Earth, for love of God, “will be the first, the noblest, and the richest” in Heaven. Thérèse also discovered one new and very important aspect of her future vocation. 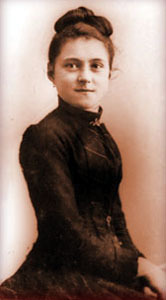 Up until that time, she always presumed that the soul of every priest was “as pure as crystal.” During the pilgrimage, she encountered many priests and began to realize that “even though the sublime dignity of Priesthood raises them higher than the Angels, they are still but weak and imperfect men.” This, however, did not discourage her. Instead, it gave her a new understanding of her future vocation as a Carmelite to pray and sacrifice for priests. She rejoiced to think that it was her mission to “preserve the salt of the Earth” in the soul of every priest. We offer our prayers and sacrifices for the apostles of the Lord; we ourselves ought to be their apostles, while they, by word and example, are preaching the Gospel to our brethren. Have we not a glorious mission to fulfill? Reflection: When you look at the diversity of people all around you, you will discover that some are very visible and honored by society, while others are silent and hidden. Some are given a dignity above the angels, while others seem to be stripped even of their human dignity. Some are wealthy and some are poor. Some are great sinners; some are living saints. In the eyes of God, all that matters is that we are faithful to the particular mission He gives us. If that means God wants you to receive many worldly honors, so be it. If that means you are to live a hidden and humble life, so be it. If that means you are to be a priest, so be it. And if that means you are to be a cloistered nun who prays for priests and other sinners, so be it. Reflect upon those whom you may envy in life. As you do, instead of envying them, pray for them. Offer sacrifices for them and beg God to keep them faithful to the vocation they have received. As Thérèse discovered her call to pray for priests, so you may discover your call to pray for others who are in need. Reflect also upon the great reward awaiting us all in Heaven if we are but faithful here on Earth. Earthly honors will mean nothing in Heaven. The virtues of faith, hope and charity will be the only marks of distinction that will remain with us forever. Saint Thérèse, your simple and humble eyes could see beyond the superficial “dignities” of this world. You also were able to see the dignity of priests, despite their many sins. Pray for me, that I may see all people as God sees them. May I love each person, rejoice in each one’s unique vocation and pray for all that they may grow in the eternal virtues. Saint Thérèse, pray for us. Lesson: On route to Rome, Thérèse’s pilgrimage stopped in Paris, and she was blessed to visit the Shrine of Our Lady of Victories! What a joy and blessing this was. In this holy spot the Blessed Virgin, my Mother, told me plainly that it was really she who had smiled on me and cured me. With intense fervour I entreated her to keep me always, and to realise my heart’s desire by hiding me under her spotless mantle, and I also asked her to remove from me every occasion of sin. Thérèse recounts that the “Blessed Virgin, my Mother, told me plainly…” This statement reveals Thérèse’s intimate connection to the Mother of God. Our Lady most likely did not appear to Thérèse in a physical form. Nonetheless, the Blessed Mother did speak “plainly” to Thérèse. This was only possible because Thérèse was so in tune with the voice of God and her heavenly Mother. The innocence, certitude and clarity with which she spoke about this conversation with the Mother of God is itself a testimony to how completely Thérèse was walking in faith. She also spoke her prayer to her Mother as a child would speak. She asked to be held close to her and not only to remove every sin, but even every “occasion of sin.” Thérèse’s prayer was answered because she asked with the simplicity of a pure faith. Reflection: When you speak to God or to our Blessed Mother, how do you pray? Do you speak with the utmost confidence and with the clearest conviction? Do you ask only for those good things that make up the will of God, or do you seek to impose your own will upon God and our Blessed Mother by making selfish requests that do not conform to the will of God? When God or our Blessed Mother speaks to you, do you hear? So often we do not hear a heavenly voice because we do not know how to listen. Thérèse knew how to listen, and so she heard Our Lady as clearly as she heard her sisters or her father speak to her. Seek to imitate this childlike conversation of Thérèse so that the love you share with the Mother of God will be as real as real can be. Saint Thérèse, you listened to and spoke to the Mother of God as a loving and attentive daughter would speak to her mother. Pray for me, that I may grow in faith and be attentive to our merciful God, to my Blessed Mother and to all the angels and saints. May I know them, love them and follow their commands every moment of my life. Saint Thérèse, pray for us. Lesson: On the train from Paris to Rome, Thérèse passed through Switzerland and was deeply impressed by the scenery of the mountains, sky, meadows, lakes, valleys and hills. It was all “so full of poetry and grandeur.” As she pondered nature, she realized that this incredible scenery was a “foretaste of the wonders of Heaven.” She also realized that once she entered the walls of Carmel, she would never see such beauty on Earth again. But this did not discourage her. Later on, when the time of trial comes, when I am enclosed in the Carmel and shall only be able to see a little bit of sky, I will remember this day and it will encourage me. I will make light of my own small interests by thinking of the greatness and majesty of God; I will love Him alone, and will not be so foolish as to attach myself to the fleeting trifles of this world, now that my heart has had a glimpse of what is reserved for those who love Him. Thérèse realized that she did not need to be continually entertained by the things of the world, or even the beauty of nature. She was given her little glimpse of Heaven on Earth and that was all she needed. She would remember this scene and allow it to continually remind her of what awaits us all in Heaven. Reflection: Have you had an experience in life through which you received a glimpse of Heaven? Perhaps it was a stunning view of nature, or a moment of deep prayer, an act of profound charity from another, or some other encounter that changed your life. Remember those moments and allow their lessons to be continually imprinted on your soul. Thérèse took a mental “snapshot” of this little Heaven on Earth in order to save it for the future when she knew she would experience “the time of trial” within the walls of Carmel. Know that trials will come, just as they did for Thérèse. But do not forget the lessons God has taught you through life, and do not fail to recall those lessons when you need them the most. Dearest Saint Thérèse, you were given a small glimpse of Heaven as you gazed upon the natural beauty God placed before your eyes. Pray for me, that I may understand the true beauty of Heaven and may be open to the many ways God wants to teach me its lessons. May I always be open to what God teaches and bring those lessons to the trials of life. Saint Thérèse, pray for us. Lesson: As Thérèse and her fellow pilgrims continued to Rome, they made many stops along the way. They saw the cities of Northern Italy and had many new experiences. Though she was intrigued with the beautiful architecture, sculptures, paintings and historical monuments, she was always looking at what she saw through her “prism of faith.” For example, while in Venice, she visited the Palace of the Doges and saw the prisons that so many had occupied of old. While visiting these dreadful prisons I fancied myself in the times of the martyrs, and gladly would I have chosen this sombre abode for my dwelling if there had been any question of confessing my faith. Her faith was always on her mind. All of these most magnificent monuments, works of art and historical buildings had to be analyzed by her through the prism of her faith. Some sites and experiences taught her about the vanity of the world. Others helped her renew her willingness to be a martyr. Still others made her think of what awaited her at Carmel. God was always on her mind. Reflection: How about you? What do you think about all day long? A good way to examine your conscience is by considering what you spend the most time thinking about throughout your day. Is God always on your mind? Allow this young teenager to teach you about the only “prism” through which you must see the world and your experiences in life. Seek to imitate Thérèse’s Little Way and to learn all of life’s lessons through this prism of faith. Dearest Saint Thérèse, as you grew and matured, and as you encountered many new people, places, and experiences in life, you saw all through the prism of faith. Pray for me, that I may see all things with the eyes of faith. May I never be seduced by the enticements of the world, and may I always encounter life with the eyes of God. Saint Thérèse, pray for us. Even this most sacred encounter with the home of the Holy Family drew Thérèse to ponder an even deeper mystery. But our greatest joy was to receive Jesus in His own House, and thus become His living temple in the very place which He had honoured by His Divine Presence. When someone is in love, a mere picture or artifact of the loved one cannot compare with that person’s real presence. Though she was inspired by the ancient little house, she was more inspired by being able to touch and consume her Lord in Holy Communion and adore His True Presence in the Tabernacle. Reflection: What inspires you the most in this world? Is it the Blessed Sacrament? Our Lord, present in the Blessed Sacrament, is the most amazing and awe-inspiring mystery this world has ever known. For Jesus to come to us in this form and to humbly manifest His very Heart and Soul under the appearance of bread and wine is the true Miracle of all miracles. Reflect upon how deeply you love our Lord in this precious gift. Seek to imitate the great faith and devotion of this teenage girl. Thérèse’s greatest joy was to be with our Lord in the Blessed Sacrament. Pray that this same joy floods your heart. Dearest Saint Thérèse, you discovered the great joy of receiving our Lord in the Blessed Sacrament and longed for Him every time He was near, hidden as a Prisoner of Love in the Tabernacle. Pray for me, that I may also burn with a deep desire to receive our Lord in the Most Holy Eucharist. May I become His new temple and a tabernacle for His Holy Presence. Saint Thérèse, pray for us. Lesson: Thérèse spent six days visiting all the many wonderful sites of Rome. She saw the Coliseum where the blood of many martyrs was shed. She visited the Catacombs and lay in the very resting place of the little martyr Saint Cecilia. She went to the church of Saint Agnes and thought about her sister Pauline, now Sister Agnes of Jesus who was back in Carmel. After visiting many other holy sites, it was on her seventh day in Rome that Thérèse saw the greatest wonder Rome had to offer…the Holy Father himself! On Sunday morning, November 20, Thérèse and the other pilgrims were blessed to attend Mass with Pope Leo XIII in his private chapel. Afterwards, each pilgrim was invited to come kneel before the Holy Father to receive his blessing in silence. The Vicar-General of Bayeux, Father Révérony, had made it clear to everyone that they were not to speak to the Holy Father. When Thérèse heard this, she turned to Céline to inquire from her what she should do. Céline quietly told her, “Speak!” Sure enough, when it was Thérèse’s turn she knelt and, with tears of hope in her eyes, made her sweet request of the Holy Father that he permit her to enter Carmel at the age of fifteen. The Holy Father listened to her and eventually responded in a thoughtful way, “Well, my child, do whatever the Superiors decide.” Thérèse made one more attempt and the Holy Father responded by saying, “Well, well! 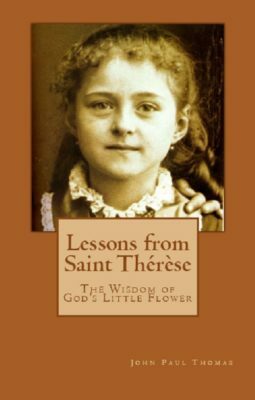 You will enter if it is God’s Will.” With that, Thérèse had to rise and exit without the immediate permission she sought. In pondering this later, Thérèse realized that the Holy Father spoke in a prophetic way. She did end up entering at age fifteen because it was the will of God. God’s will cannot be stopped when we cooperate with it. Not even those who have much authority, even within the Church, can thwart the will of God when the faithful are obedient to His gentle promptings of grace. Reflection: How far are you willing to go to fulfill the will of God in your life? Sometimes God allows what appears to be insurmountable obstacles to arise in our lives so that He can strengthen us and test our resolve. Reflect upon your own response to obstacles that seem insurmountable. Nothing is impossible for God when He wills it. Our one and only duty is to be obedient to Him in all things. When we are obedient and do not waver, God will move mountains and provide clear passage for the fulfillment of His perfect plan. Dearest Saint Thérèse, you faced one obstacle after another as you sought to answer God’s call to enter Carmel at the age of fifteen. In the face of every challenge, you responded with faith and hope. Pray for me, that I may also live in faith and in hope throughout my life, to say “Yes” to God’s perfect will, no matter the cost and no matter how hard. May I imitate your determination of faith and continue down the glorious path God has prepared for my life. Saint Thérèse, pray for us. Lesson: As Thérèse and her fellow pilgrims continued to journey through various towns of Italy, they daily stayed in some of the nicest hotels. But these “splendid” hotels lent themselves to more reflection by Thérèse. I realised thoroughly that joy is not found in the things which surround us, but lives only in the soul. One could possess it as well in an obscure prison as in the palace of a king. And so now I am happier at the Carmel, in the midst of trials within and without, than I was in the world where I had everything I wanted, and, above all, the joys of a happy home. Thérèse was staying in the best hotels, and back in Lisieux she was blessed with such a happy home. Though she was grateful for these earthly blessings, she was also keenly aware that none of them could give her true joy. Joy was found “only in the soul.” And no matter if she were in the most luxurious surroundings or in the darkest prison, joy in the soul had its origin only in God and in the fulfillment of His perfect will. For her, that fulfillment would be achieved only in Carmel. Reflection: Do you have true joy in your life? Sometimes you might be deceived by passing pleasures in life, equating them with joy. But joy is a spiritual gift that comes only from God and that lives within the depths of your soul. Have you encountered this spiritual gift from God? Reflect upon the difference between “pleasure” and “joy.” The things of this world offer pleasure, but they do not offer joy. Seek to be obedient to the will of God. In that single-minded commitment, you will find the joy that your soul seeks. Dearest Saint Thérèse, as you journeyed through the beautiful and impressive towns of Italy, your heart’s desire was set upon the hidden walls of Carmel where you knew you would find the joy you sought. Pray for me, that I may keep my eyes fixed upon the one joy of fulfilling the will of God in my life. May I, like you, never be deterred or seduced by the passing pleasures of this world and seek only that which is eternal. Saint Thérèse, pray for us. Lesson: Clearly, Thérèse had just one thing on her mind throughout her pilgrimage. No matter what she saw and no matter whom she encountered, she kept focused upon the call God was placing in her heart. By this time, she had exhausted every earthly means of achieving the will of God to enter Carmel at age fifteen. She had spoken to the Mother of Carmel, the priest Superior, the Vicar General, the Bishop and even the Pope. Though she had not yet obtained the “Yes” she sought, she did not give up. After visiting Assisi, where Saint Francis and Saint Clare lived their inspiring lives, she ended up in the last carriage to leave, which was the carriage of the Vicar General, Father Révérony. He was very kind to her and from time to time spoke to her about Carmel, promising that he would do everything possible to help her enter at age fifteen. This meeting was like balm to my wounds, though it did not prevent me from suffering. I had now lost all trust in creatures and could only lean on God Himself. Though Thérèse was consoled by the promise of this good priest to help her enter Carmel, she had learned a valuable lesson. In the end, God alone was worthy of her complete trust. Human beings will always fail in one way or another. Even those within the Church will, at times, hinder the will of God. But that was no reason to lose trust. Instead, Thérèse resolved to trust more deeply and to trust in God alone. Reflection: We have all met with the sins and weaknesses of others. This can be the cause of discouragement, but it can also become the source of deeper trust in God alone. Do you have a difficult time trusting? Is there someone in your life who has tempted you to lose trust and turn toward discouragement? If so, reflect upon this temptation and allow it to become the source of your deeper trust in God. God can and will do all good things in our lives when we trust that He can work miracles, despite the weaknesses and sins of those all around us, including ourselves. Dearest Saint Thérèse, your determination and devotion to answering your call are inspiring. Pray for me, that I will not allow anything to hinder me from seeking and fulfilling the will of God in my life. May I trust in all things and allow my trust to be centered in God alone. Saint Thérèse, pray for us. Lesson: After Thérèse returned from her pilgrimage, she went to Carmel to share her thoughts and experiences with Mother Marie de Gonzague who instructed her to write to the Bishop to remind him of his promise. Thérèse did this immediately. She wrote a number of drafts, but before the letter was sent, both Pauline and Mother Marie de Gonzague had second thoughts about the wisdom of writing the Bishop. However, her letter was finally sent in hopes that Thérèse would receive a favorable response before Christmas. Every day she and her father went to the post office to look for her letter of permission, but it never arrived. Finally, she had to accept that she would not enter before Christmas. On December 28, Mother Marie received a letter from the Bishop granting his permission, and it was with great joy, mixed with sorrow, that Thérèse received word of this on January 1. God had worked His miracle! Pauline, however, now wanted Thérèse to wait until after Easter to enter! Their father was upset about this, but Thérèse accepted this decision with much grace. I could not restrain my tears at the thought of such a long delay. This trial affected me in a special manner, for I felt my earthly ties were severed, and yet the Ark in its turn refused to admit the poor little dove. The plans and correspondence continued, and Thérèse experienced many emotions. This lovely girl of fifteen had persevered and was now able to formally take up her Carmelite cross on April 9, 1888, at the age of fifteen. Reflection: Perseverance is difficult to endure while we are actually in the act of persevering. Yet when we see that the fruits of our efforts are rewarded by the fulfillment of God’s will, all the suffering that was endured is turned sweet and becomes our reward. Is there something in your life at this moment through which God wants you to persevere? Is there some trial that is painful, confusing and difficult to endure? If so, press on. Do not be deterred by the difficulty. Instead, look forward to reaping the reward of your fidelity. God is always faithful, and He will repay your perseverance a hundredfold. Dearest Saint Thérèse, you never despaired down the path toward your vocation, even though it was a path difficult to travel. Pray for me, that I may persevere through my own trials in life and do so with strength and confidence. May I imitate you and also be rewarded for my fidelity to the will of God. Saint Thérèse, pray for us.